Restoring the smile with dental implants is a unique process that can benefit individuals missing one or many teeth. Dental implants can rebuild confidence in the smile with permanent solutions that can last a lifetime. Our Annapolis dentists, Drs. Anthony and Cynthia Boyd, are experienced in general dentistry, giving every patient the time and attention they need to have a beautiful smile. With dental implants and restorations, we believe your smile can be restored to fullness. Lasting oral health relies on teeth to maintain jaw bone density and a normal bite. When teeth are lost, damaged, or extracted, normal function can be affected. Without a supporting tooth root, the jaw bone begins to deteriorate, losing strength and density. Dental implants themselves are titanium screws that are placed inside the jaw bone, which become part of the smile through a natural process where the jaw bone fuses with your implant. After the implants becomes part of the smile, our Annapolis dentists place a custom porcelain restoration. When the process of receiving implants and restorations is complete, youth can be returned to the smile. 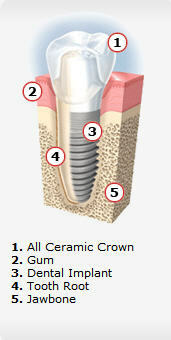 When patients are looking for dental implants, the first step is to receive a consultation and examination. This will reveal whether pre-implant placement oral surgery is necessary or not. Sometimes individuals need a bone graft or sinus augmentation to ensure that the jaw bone will provide a strong foundation for implants. After the initial exam, the next step is to x-ray your mouth and provide detailed impressions of your smile that can be used to plan your dental implant placement. We work with a network of trust professionals that place implants and also do the preparatory surgeries. After receiving implants, patients are given a temporary restoration that allows their smile to function normally. After a few months, when the implants have fused with the bone, we will place the restoration and complete the smile. When crafting the perfect restoration, it is important to use quality materials that will match the sheen and strength of teeth. Drs. Anthony and Cynthia Boyd only use porcelain, a resilient and long lasting material, to make restorations. Single teeth receive crowns while multiple teeth can be replaced by implant-supported bridges, which reduces the need of using existing teeth as supporting structures. Whole arches can be fixed with partial dentures that are affixed to dental implant abutments. Dental implants and restorations are a dynamic solution that can be tailored to nearly any need. Our practice provides comprehensive solutions that answer each patients’ unique needs. Contact us today via phone, email, or our online form, and start your journey toward transformative dental solutions.